“How do you make cheap clothing look expensive?” is one of the most common questions I am asked. The belief is that there is some trick afoot, some skill through which you can conceal ‘cheapness.’ The truth is that cheapness can never be concealed; it can only be removed. Similarly, expensive items can often look cheaper than they are when worn poorly, with little style or coordination. The incorrect assumption in both situations is that all expensive things fit properly and look good and that all cheap things don’t fit and look bad. I believe that what people really mean by ‘cheapness’ and ‘expensiveness’ is actually tastelessness and tastefulness; the standards by which all anthropogenic things are judged. ‘Good taste’ is a nebulous concept, prized for its incorporation and representation of the quality of human thought. It has therefore no consistent relationship with expense. Tangerine silk suits and garish gold taps may be extremely expensive but look cheaper than materials available at a fraction of the price. Texture and pattern are the most important considerations beyond the cut of the suit. Quality of finish is, of course, highly desirable but the best of it (Milanese buttonholes, hand sewn linings etc) come at a very high price. Matte, flat texures are best; flannels and birdseyes. Weaved patterns are also good – think herringbone tweed and cavalry twill. Flannel is the easiest to find (Massimo Dutti, Uniqlo). 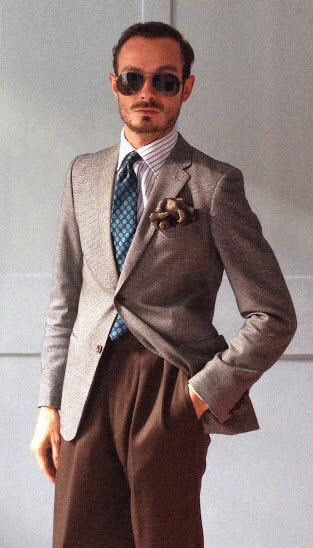 Herringbone tweed is also widely available (J.Crew, Hackett). Subtle patterns are often better than plain colours, particularly in lighter shades; a Glen Urquhart (Prince of Wales) check is, I find, a more tasteful option than a plain light grey worsted or twill suit, which can look rather like a pair of Farah trousers. Similarly, a subtle stripe or check often works better than plain fabrics in darker charcoals, which can look too funereal. Tweaking RTW garments to make them unique is one of the best ways to improve them and eliminate any cheapness. Plastic buttons are easily replaced with shell or horn buttons. Though brands like J. Crew and Massimo Dutti now offer decent quality buttons, many high street brands still use poor quality stock. Natural is always better than man-made when it comes to button material. I think one of the best tweaks I have employed is with trousers; giving long trousers a healthy-sized turn-up and tapering them to the ankle whilst retaining the size in the thigh down to the knee. Even discount trousers from brands such as River Island and H&M. It sounds so simple but accessorizing properly makes a huge difference to inexpensive garments. The nasty ‘pocket lining’ decorations they stuff into high-street blazer pockets should be discarded upon purchase. Instead, venture into the seasonal sales on Jermyn Street (e.g. TM Lewin, Fortnum & Mason) to pick up some fine silk twills. Alternatively, though a little more expensive, Augustus Hare and Drakes offer artistic pocket decorations that will liven up the most basic of garments. Ties should not be ignored. Too many men spend large sums on suits and shoes and ignore the aesthetic of the tie. They buy shiny twills, not insignificant in price, but entirely lacking in artistry. Instead of splashing on garish, gilded neckwear in uncomfortably thick silk, go vintage and get on eBay. It requires patience but you can end up with some beautiful, and sadly neglected, neckwear. You make very interesting points. I have an excellent tailor for hand-made suits here in Los Angeles. I expect the best from him and I think he delivers, but when I’ve asked about furnishings like ties, he’s surprised me. His house leans British and I mentioned I was interested in Drakes but the response seemed to be that Tie Bar is good enough. Tie Bar does have some nice items (in my opinion) at very low cost. But I see TV news reporters wearing the same ties I’m wearing… is that entirely too snobbish? I really do love vintage ties from the 1930s through ’50s but have not yet found any in good condition. Nice article. Agree about the eBay ties. Thrift shops are also worth checking. Some nice old ties get donated and sell cheaply. Thrift shops are good for hard to find ties like wool ties. Here, in Australia, regular retail stores no longer sell wool ties. They are like spats – extinct menswear.